Kobe Bryant, 36, has been playing basketball in the NBA for 18 years. He’s been playing at an elite level the whole time, defying time through meditation, paleo diets, and mysterious surgeries in Germany, keeping him on track to pass Michael Jordan this season as the third-highest scorer in regular-season history. But even Bryant will retire some day, and when he does the incredible competitor will face a new challenge in finding what to do with the rest of his life. 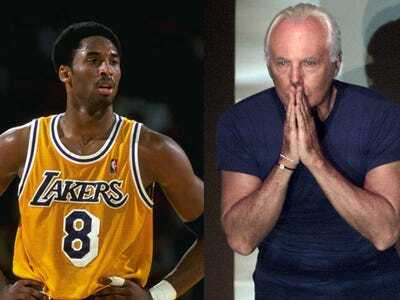 Bryant speaks Italian and has a close connection to Italy, having lived there for much of his childhood while his father Joe “Jellybean” Bryant played basketball overseas. Bryant is apparently a fan of Armani’s work, too, as he owns several Armani suits and sported one of them in a Turkish Airlines ad campaign in 2011.
, Bryant read lots of business books and filled notebooks with ideas. “Just nothing but sketches and drawing and org charts and direction and all this s—. Conversations I’ve had with muses, how they built their company, notes and all kinds of s—,” he told SI. “You can start in the Nike Family, I cold call Mark Parker all the time. Jony Ive. Dan Wieden. Oprah Winfrey. Recently Arianna Huffington. The list just goes on and on and on and on. Hilary Swank,” he told Bloomberg. Most recently, his biggest off-court exploit is a Showtime documentary titled “Muse,” which will air in November.